Italy is made up of twenty regions with distinct characteristics. Every town, every village, makes the same dish in vastly different ways, and every town and village has its proudest specialty. These cooking traditions define people's identities just as much as their dialects and their traditional costumes. Local cooking preferences and customs are shaped by geographic, historical, and climactic differences: some regions are landlocked and mountainous, others hug the sea and are hilly; some regions have absorbed Arab or Greek influences, others have been marked by the French or Austrians; some regions live under the dazzling Mediterranean sun most of the year, others have cold winters, snow, fog, and harsh winds. 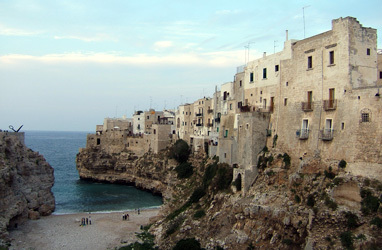 Italy is a small country (less than half the size of Texas), but it is one with a long and venerable history. From the fall of the Roman Empire in 476 to 1861, when it was finally unified under one kingdom, Italy was made up of independent city states, republics, and regions that spent much of their time fighting off encroaching neighbors and outside intruders. This, along with the fact that the large-scale exchange of culinary traditions among Italians is a recent phenomenon (linked to modern roads, technology, and an improved post-war economy), explains how Italy managed to maintain its varied cuisines into the twenty-first century. As I was researching my cookbooks, I visited every region of Italy, from the well-traveled country roads of the Chianti wine zone in Tuscany to the deserted peaks of Monte Pollino in Basilicata. I talked to local cooks, ate at people's homes, shopped in the open-air markets. What I found, time and again, is that a dish that was much loved in one town was unheard of a few miles down the road. And what I concluded is that there is no such thing as "Italian cuisine:" rather, Italy is made up of many distinct cuisines, each with its own flavor palette and preferred cooking techniques, which can be roughly grouped within regional boundaries. While we can talk about general tendencies (for instance, northern Italians eat more rice and polenta than southern Italians, and southern Italians cook almost exclusively with olive oil, barely touching butter), it is the smaller place-specific differences and particularities that are most fascinating: for example, some dishes are prepared only in certain cities, like the braised goat of Campi (Tuscany) or the figure eight-shaped pasta called corzetti of Valpolcevera (Liguria). The richness of Italian cuisine lies in its diversity. From delicate tortelli filled with squash in Lombardy to spaghetti tossed with salted gray mullet roe in Sardinia, regional food preferences and cooking styles vary widely across Italy. Each recipe, each dish has its own history. Some recipes are thousands of years old and have changed very little over the course of time; others were born in the Renaissance or after the discovery of the New World, when a wealth of new foodstuffs like tomatoes, beans, peppers, zucchini, corn, and cocoa reached European shores; still others appeared in the last decade or so, novel elaborations on ancient themes. This site is my way of passing on knowledge about Italian regional cooking to as many people as possible. I explore the amazing diversity of Italian regional cuisines, explain how they came to be, and provide you with flavorful, easy-to-make heirloom recipes, as well as information about regional specialties, places to visit in Italy, and not-to-be-missed experiences. Everything you read here is the fruit of my many trips to Italy, of years spent uncovering and researching Italy's gastronomic treasures. Navigate the site to learn more about the regions you know little about and to expand your knowledge of those you are already familiar with, and email me at micol@rusticocooking.com if you have questions about Italian cooking or regional Italian cuisines. And if you like, join me in one of my hands-on cooking classes in New York City, where we cook full menus featuring Italy's tastiest regional specialties. 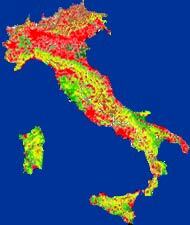 This satellite map of Italy displays the pattern and density of stable night lights (cities, villages, gas flares, etc. ), and roughly correlates with population density (red=dense). The map illustrates the fact that Italy's population is highly concentrated in the North and in some urban areas along to the coastline. Map adapted from IIASA.